That's right, even after a weekend gardening and mowing in tank tops I'm still rocking a fantastic farmer's tan. I find that it perfectly accentuates my red neck. And it makes me very patriotic. That's right. What's red, white, and blue? Clearly I need more spaghetti straps in my life. Or better sunscreen for my forearms. Whoever said you can't tan through SPF 30? I am BRANDED FOR LIFE! I swear that tan line never leaves. Even if I apply self tanner like a madwoman, say to be a part of a wedding, it is still there. Lurking. Just waiting for a chance to shine. Preparing to proclaim to the world that I am a farm girl. You know what? I am strangely alright with it. 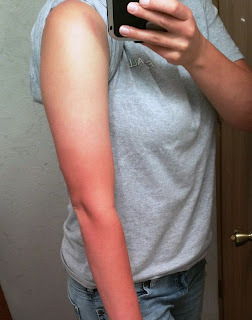 It may be a farm girl problem, but I kinda love rocking my farmer's tan!